Our poisonous friend under water; you can see the roughness of the skin on its back. Sometimes when I'm out looking for insects to photograph, I see other things. Imagine a creature sporting a neurotoxin hundreds of times more deadly than cyanide in sufficient quantities to kill a full grown man. And it's common in our area. 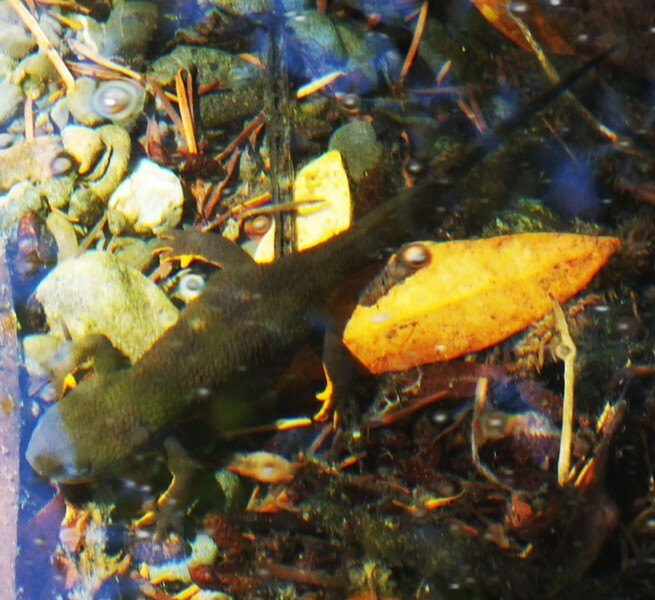 The Rough Skinned Newt (Taricha granulosa) sports the same toxin that makes the pufferfish and harlequin poison-dart frogs so deadly, tetrodotoxin. I wasn't at all familiar with this species until I had the pleasure of seeing several in a slackwater portion of the Van Duzen River periodically surface, breathe and almost disappear among the dead leaves lining the riverbed. According to the Seattle Times, a 29-year-old man in Oregon swallowed one on a dare and died within hours. The toxin interferes with the transmission of nerve impulses, causing progressive numbness, paralysis and eventually cardio pulmonary failure. There is no known antidote. Fortunately, the toxin does not transmit through skin, which is why children have played with them with no ill effect. It is totally a defensive weapon. 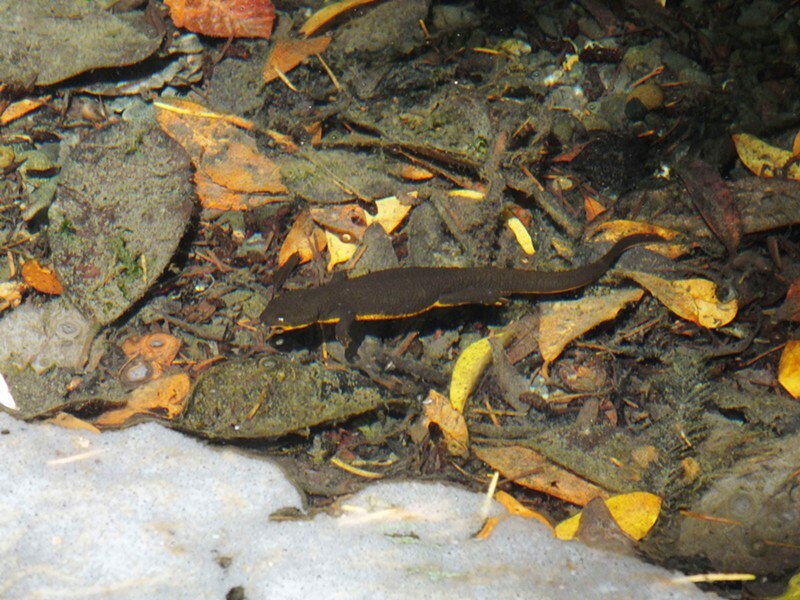 The newts have two known natural enemies: the common garter snake and other larger rough skinned newts, both of which have a limited tolerance for the poison. Just swimming along, all deadly and stuff. 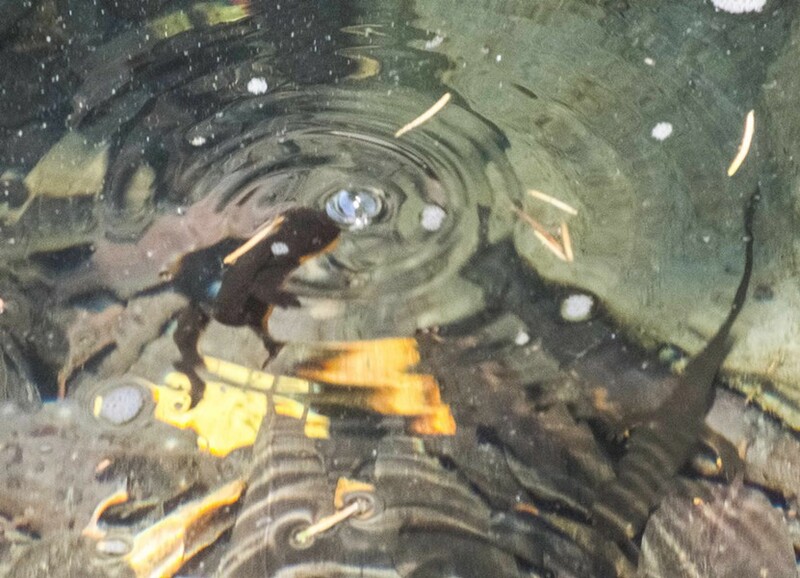 So, if you're out and about and see a dark-backed, orange-bellied salamander, keep your pets and kids away from it — all in all it's probably best for everyone to just let it go its own way.